DAP is a DMDU approach for designing a plan that explicitly includes provisions for adaptation as conditions change and knowledge is gained. The resulting plan combines actions to be taken right away with those that make important commitments to shape the future and those that preserve needed flexibility for the future. The approach includes the specification of a monitoring system, together with the specification of actions to be taken when specific trigger values are reached. This chapter describes the DAP approach and illustrates it with a (more or less) fictitious case. A real-life application is given in Chap. 8. Most strategic plans implicitly assume that the future can be predicted. A static plan is developed using a single future, often based on the extrapolation of trends, or a static ‘robust’ plan is developed that will produce acceptable outcomes in a small set of plausible future worlds. However, if the future turns out to be different from the hypothesized future(s), the plan might fail. Furthermore, not only is the future highly uncertain, the conditions planners need to deal with are changing over time (the economic situation, annual rainfall, etc.). 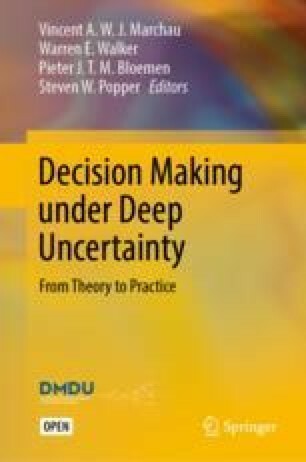 This chapter describes an approach for planning under conditions of deep uncertainty called Dynamic Adaptive Planning (DAP). This approach is based on specifying a set of objectives and constraints, designing an initial plan consisting of short-term actions, and establishing a framework to guide future (contingent) actions. A plan that embodies these is explicitly designed to be adapted over time to meet changing circumstances. DAP was first outlined by Walker et al. (2001) and made more concrete by Kwakkel et al. (2010). DAP has been explored in various applications, including flood risk management in the Netherlands in light of climate change (Rahman et al. 2008) and policies with respect to the implementation of innovative urban transport infrastructures (Marchau et al. 2008), congestion road pricing (Marchau et al. 2010), intelligent speed adaptation (Agusdinata et al. 2007), and ‘magnetically levitated’ (Maglev) rail transport (Marchau et al. 2010). Central to DAP is the acknowledgment of uncertainty, that ‘in a rapidly changing world, fixed static policies are likely to fail’ (Kwakkel et al. 2010). As new information becomes known, the plan should incorporate the ability to adapt dynamically through learning mechanisms (Kwakkel et al. 2010; Walker et al. 2001). The DAP approach is carried out in two phases: (1) the design phase, in which the plan, monitoring program, and various pre- and post-implementation actions are designed, and (2) the implementation phase, in which the plan and the monitoring program are implemented and contingent actions are taken, if triggered. The five steps of the design phase are shown in Fig. 3.1. Once the plan is established through the five design steps shown, the plan is implemented and monitoring commences. As a foundation for the plan, the goals and objectives that are important to the planners and stakeholders are defined—i.e., what constitutes a successful outcome. Constraints on the plan are identified, and a set of alternative actions to achieve the objectives are analyzed. In Step II, an initial plan that meets the goals and objectives is assembled from the alternatives that have been identified (as might be done, for example, in a traditional policy analysis study (Walker 2000)). The necessary conditions for success are outlined (e.g., social, technological, physical, political, economic, or other conditions necessary for the plan to succeed). It is very important in this step to identify the range of necessary conditions for success, as these are used in later steps to identify vulnerabilities, signposts, and triggers. For this reason, it is important to involve managing agencies, as well as other stakeholders. The static robustness of the initial plan is increased through a series of anticipatory actions taken in direct response to vulnerabilities and opportunities. Vulnerabilities that can diminish the success of the initial plan, and opportunities that can increase the success of the initial plan, are first identified. Analytical tools, such as Exploratory Modeling and Analysis (EMA) (Bankes et al. 2013), and scenario analysis (van der Heijden 1996), or expert opinions using Strengths, Weaknesses, Opportunities, and Threats (SWOT) analysis (Osita et al. 2014), may be used to investigate plausible future conditions to ensure that relevant vulnerabilities are identified. An approach based on EMA, called Scenario Discovery (Bryant and Lempert 2010; Kwakkel et al. 2012), can be used to identify the scenarios in which a plan would perform poorly. These scenarios highlight the vulnerabilities of the plan. Then, actions can be specified to protect the plan from failing if any one of these scenarios occurs. A way to specify protective actions is to use threats, opportunities, weaknesses, and strengths (TOWS) analysis (Weihrich 1982), which uses a SWOT analysis as input, and translates the outcomes of the SWOT analysis into actions. Other possible techniques include Delphi (Rowe et al. 1991), ABP (Dewar et al. 1993), and scenario analysis (van der Heijden 1996). Mitigating actions (M)—Actions that reduce adverse impacts on a plan stemming from certain (or very likely) vulnerabilities. Hedging actions (H)—Actions that reduce adverse impacts on a plan, or spread or reduce risks that stem from uncertain vulnerabilities (much like buying car insurance). Exploiting actions (E)—Actions that take advantage of (uncertain) new developments that can make the plan more successful, or succeed sooner. Mitigating actions and hedging actions prepare the initial plan for potential adverse effects and in this way try to make the plan more robust. Seizing actions and exploiting actions are actions taken now to change the policy in order to take advantage of available opportunities, which can also make the plan more robust. In contrast, shaping actions are proactive and aim at affecting external forces in order to reduce the chances of negative outcomes or to increase the chances of positive outcomes. As such, shaping actions aim not so much at making the plan more robust, but at changing the external situation in order to change the nature of the vulnerability or opportunity. For example, marketing is an attempt to increase the demand for a given product. In this way, one tries to prevent insufficient demand for the product. A monitoring system is developed that will inform decisionmakers about actions that can be taken in response to new conditions. This constitutes the learning component that gives DAP the flexibility to adapt to new conditions over time. This introduces the element of adaptive robustness, which makes DAP able to deal with deep uncertainty, and distinguishes it from scenario-based approaches that are based on responding to a single or small set of hypothesized futures to achieve static robustness. The monitoring program consists of signposts and triggers. Signposts specify the types of information and variables that should be monitored to show (1) whether the initial plan is currently achieving its goals and/or (2) whether the vulnerabilities and opportunities identified in Step 3 are impeding the plan from achieving its goals in the future. Triggers are the critical signpost levels or events that, when they occur, signify that (contingent) actions should be taken to ensure the initial plan remains on course in order to continue to achieve its specified goals. Defensive actions (DA)—Responsive actions taken after implementation of the initial plan to clarify the plan, preserve its benefits, or meet outside challenges in response to specific triggers, but that leave the initial plan unchanged. Corrective actions (CR)—Adjustments to the initial plan in response to specific triggers. Capitalizing actions (CP)—Responsive actions taken after implementation of the initial plan to take advantage of opportunities that further improve its performance. Reassessment (RE)—A process initiated when the analysis and assumptions critical to the plan’s success have lost validity (i.e., when unforeseen events cause a shift in the fundamental goals, objectives, and assumptions underlying the initial plan). and the monitoring program developed in Step IV. If one of the signposts’ trigger events occurs after implementation of the initial plan, one or more of the contingent actions developed in Step V is executed. If the original objectives of the plan and constraints on it remain in place upon occurrence of the trigger event, then defensive or corrective actions will be taken. If the monitoring program encounters an opportunity, then capitalizing actions will be taken. 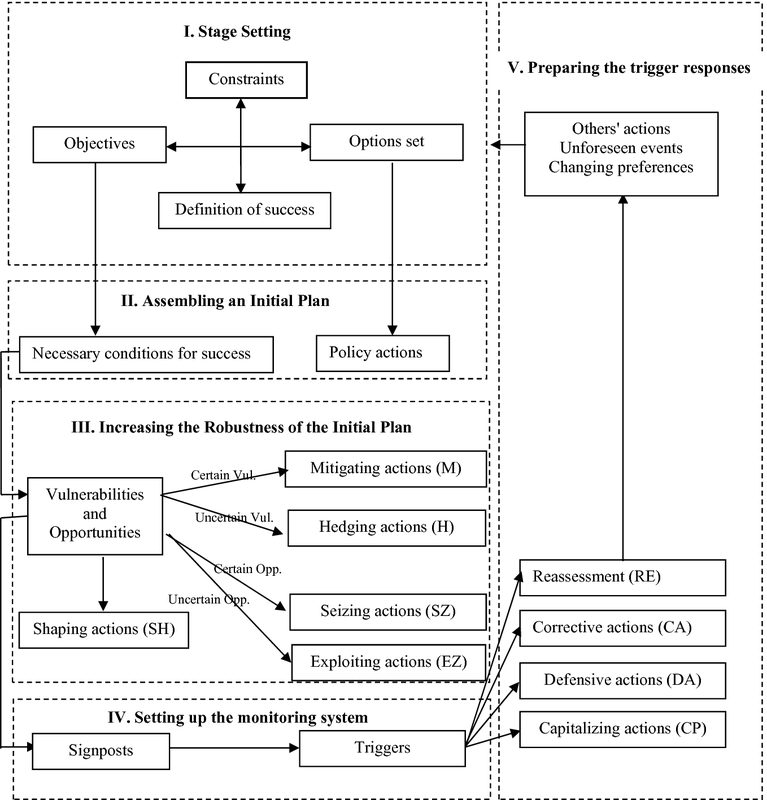 If the monitoring program indicates a change that invalidates the initial plan’s goals, objectives, or intended outcomes (e.g., vulnerabilities exist or evolve beyond those considered during Step III—for example, the occurrence of a ‘Black Swan’ event (Taleb 2007)), then the complete plan is reassessed. However, reassessment does not mean completely starting over, as the knowledge of outcomes, objectives, measures, etc., learned during the initial DAP process would accelerate the new planning process. Amsterdam Airport Schiphol’s position as a hub within Europe is under pressure. The merger of Air France and KLM has resulted in the threat that KLM, Schiphol’s hub carrier, which is responsible for more than half of the scheduled aircraft movements at the airport, might move a significant portion of its operations to Charles de Gaulle Airport. The other major airports in Europe are planning on expanding their capacity or are developing dual airport systems, while Schiphol’s capacity is under threat of being reduced due to climate change induced changes in wind conditions and lack of societal support for capacity expansion. Together, this makes the long-term planning for Schiphol both urgent and problematic. In the remainder of this section, we illustrate how each of the steps of DAP might be applied to the case of the long-term development of Schiphol. Its purpose is to illustrate DAP and how it could be applied in practice. To make the approach clear and understandable, the example simplifies some of the key challenges Schiphol faced in the recent past, when this study was performed. Therefore, the case should not be understood as presenting a realistic plan for the long-term development of Schiphol. It is merely an example loosely based on real planning issues and debates that planners are currently facing with respect to the long-term development of an airport. As outlined in its long-term vision (Schiphol Group and LVNL 2007), the main goals of the Schiphol Group are (1) to create room for the further development of the network of KLM and its Sky team partners, and (2) to minimize (and, where possible, reduce) the negative effects of aviation in the region. Underlying the first goal is the implicit assumption that aviation will continue to grow. However, in light of recent developments such as climate change and the financial crisis, this assumption is questionable. Therefore, as part of our ‘thought experiment,’ we rephrased this first goal more neutrally as ‘retain market share.’ If aviation in Europe grows, Schiphol will have to accommodate more demand in order to retain its market share, while if aviation declines, Schiphol could still reach its goal of retaining market share. Invest in noise insulation of surrounding buildings and houses. Some of these actions can be implemented immediately (e.g., using the existing runway system in a more efficient way). For others, an adaptive approach would be to begin to prepare plans and designs (e.g., for a new runway), but to begin actual building only when conditions show it to be necessary (i.e., when it is triggered). The various alternative actions can, of course, be combined. The actions are constrained by costs, spatial and legal restrictions, public acceptance, and the landside accessibility of Schiphol. The definition of success includes that Schiphol maintains its market share and that living conditions improve compared to some reference situation (e.g., number of people affected by noise within a specified area). An initial plan might be to immediately implement existing plans for using the runways more efficiently (alternative 3) and in a way that reduces noise impacts (alternative 4). It might also include all alternatives that focus on planning capacity expansions, without beginning to build any of them (i.e., alternatives 1, 2, and 5). A final element of the initial plan would be alternative 7: invest in noise insulation. The choice for only planning capacity expansions but not yet building them is motivated by the fact that Schiphol is currently constrained by the environmental rules and regulations, not by its physical capacity. This also motivates the choice for alternatives 3 and 4, which together can reduce the negative externalities of aviation. In addition to the capacity expansions, Schiphol can develop plans to move charter operations to nearby Lelystad Airport, which would reduce noise around Schiphol and increase Schiphol’s capacity for regular flight operations. In order to realize such a move, Lelystad Airport would need to be expanded considerably, so planning should be started right away. Charter operations should then be moved there as soon as possible. In the short run, this would create additional capacity and reduce noise at the edges of the night, which is favorable for Schiphol, because the current noise regulation system heavily penalizes flights in the evening (19.00–23.00) and during the night (23.00–07.00). Note that Schiphol is currently implementing a plan for moving some operations to Lelystad. In summary, the initial plan involves using the existing runway system in a more efficient and noise-reducing way; investing in noise insulation; and initiating plans for capacity expansion. Schiphol’s competitive position in terms of available capacity in Europe does not decrease. The long-term development of Schiphol is complicated by the many and diverse trends and developments that can affect Schiphol. These developments and trends present both opportunities and vulnerabilities for the initial plan. Some of these vulnerabilities are fairly certain. These are given in Table 3.1. Two fairly certain vulnerabilities of the initial plan are resistance from stakeholders and a reduction in landside accessibility. The mitigating actions for addressing these vulnerabilities are very similar to actions under discussion by the Dutch government (V&W 2007). A shaping action for the vulnerability of landside accessibility is investment in research. In addition to vulnerabilities, there are also some opportunities available to Schiphol. First, there is research showing the potential for ‘self-hubbing’ (Burghouwt 2007; Malighetti et al. 2008). Self-hubbing means that passengers arrange their own flights and routes, using low-cost carriers or a variety of alliances, in order to minimize costs and/or travel time. Schiphol has a great potential for attracting such self-hubbing passengers because it has direct links to about 300 destinations. Schiphol can seize this opportunity by developing and implementing services tailored to self-hubbing passengers, such as services for baggage transfer and help with acquiring boarding passes. Furthermore, Schiphol could take into account walking distances between connecting European flights when allocating aircraft to gates. A second opportunity is presented by the fact that airports in general, and Schiphol in particular, are evolving into ‘airport cities.’ Given the good transport connections available, an airport is a prime location for office buildings. Schiphol can seize this opportunity by investing in non-aeronautical landside real estate development. Not all vulnerabilities and opportunities are very likely. The real challenge for the long-term development of Schiphol is presented by uncertain vulnerabilities and opportunities. Table 3.2 presents some of the uncertain vulnerabilities, together with possible hedging (H) and shaping actions (SH) to take right away to handle them. The vulnerabilities and opportunities can be directly related and categorized according to the success conditions specified in the previous step. With respect to the success condition of retaining market share, air transport demand might develop significantly different from what is hoped and anticipated. Schiphol can respond to this development by making Lelystad Airport suitable for handling non-hub-essential flights. Another vulnerability is that KLM might decide to move a significant part of its operations to Charles de Gaulle Airport in Paris. This will leave Schiphol without its hub carrier, significantly reducing demand, and changing the demand to origin–destination (O/D) demand. Schiphol could prepare for this vulnerability by making plans for adapting the terminal to the requirements of an O/D airport, and by diversifying the carriers that serve Schiphol. Schiphol can also try to directly affect KLM by investing in a good working relationship, reducing the chance that KLM will leave. There is also uncertainty about the future of the hub-and-spoke network structure. Due to Open Sky agreements and the development of the Boeing 787, long-haul low-cost, hub bypassing, and self-hubbing become plausible, resulting in the emergence of long-haul low-cost carriers (LCC) and increasing transfer between short-haul low-cost, and long-haul carriers (both LCC and legacy carriers). Schiphol can prepare for this by developing a plan to change its current terminal to serve a different type of demand, and by taking these plausible developments into consideration when designing the new LCC terminal and its connection with the existing terminal. If a transformation to international O/D traffic and/or a no-frills airport is needed, this plan can be implemented, making sure that the transformation can be achieved quickly. H: Design existing and new LCC terminal to allow for rapid customization to airline wishes. The second success condition is that the population affected by noise, and the number of noise complaints, should not increase. Vulnerabilities and opportunities associated with this condition are that the environmental impacts of aircraft decreases, the population density in the area affected by noise increases, and the valuation of externalities (predominantly noise) by the large public changes. If the current trend of decreasing environmental impact slows down, the area affected by noise might increase. If demand increases, it is also possible that the area affected by noise will increase. On the other hand, the trend could also accelerate, giving Schiphol the opportunity to expand the number of flights that is handled. Given the potential impact of this trend, Schiphol should try and shape its development by investing in R&D and negotiate with air traffic control about testing noise abatement procedures, such as continuous descent approaches. If the population density changes, the situation is similar. If it increases, the number of people affected by noise will increase, while if it decreases, the number of people affected by noise will decrease. Schiphol can try and shape this development by negotiating with surrounding communities about their land use planning, and invest in research (or even implement measures) that can make the area affected by noise smaller. It can also hedge against a growing population density by starting to test noise abatement procedures outside peak hours. This will make the area affected by noise smaller. Thus, even if the population density increases, the total number of people affected will not increase. A third uncertainty is how the valuation of noise will change in the future. If noise will be considered more of a nuisance, complaints are likely to go up and vice versa. Schiphol could try to affect this valuation by branding the airport as environmentally friendly and support the development of an emission trading scheme that also includes aviation. The third success condition is that Schiphol’s competitive position in terms of available capacity in Europe does not decrease. Schiphol is vulnerable to capacity developments at other airports in Europe. The major hubs in Europe are all working on expanding their capacities, either by adding runways and expanding terminals, or by moving non-hub-essential flights to alternative airports in the region. Schiphol should monitor these developments closely and, if necessary, speed up its capacity investments. A second vulnerability is the robustness of Schiphol’s peak hour capacity across weather conditions. Under southwesterly wind conditions, Schiphol’s hourly capacity is almost halved, resulting in delays and cancellations. If (e.g., due to climate change) these wind conditions were to become more frequent, Schiphol would no longer be able to guarantee its capacity. Schiphol should hedge against this by having plans ready for building the sixth runway. Step IV sets up the monitoring system and identifies the actions to be taken when trigger levels of the signposts are reached. The vulnerabilities and opportunities are those presented in Table 3.2. Table 3.3 shows the signpost to be set up for each vulnerability and each opportunity, and the possible responsive actions in case of a trigger event. The numbers used as triggers are for illustrative purposes only. For example, if demand increases twice as fast as expected, this presents an opportunity (extra business) and a vulnerability (increased noise) and triggers capitalizing and defensive actions. Suppose that demand grows, e.g., 25% slower than anticipated. This presents a threat to the plan. In reaction, investments in capacity are delayed or even canceled. If demand either fully breaks down or explodes, then the plan should be reassessed. After Step V has been completed, the dynamic adaptive plan has been completely designed. That plan is then implemented. It consists of the initial plan specified in Step II, the actions specified in Tables 3.1 and 3.2, and the system of monitoring, triggers, and actions specified in Table 3.3. Note that the new runway being planned in the initial plan is not built yet, but can be built easily when necessary in light of demand increases or capacity decreases at other major European airports. As such, it is what is known as a ‘real option.’ Planning should also be started for the new terminal (including its connections to the highway system, the rail system, and required utilities). However, construction of the terminal itself should begin only if triggered by demand developments or capacity developments at other airports. During implementation, Schiphol monitors the development. Schiphol might experience faster growth than anticipated in the plan. The signposts might indicate that Schiphol is maintaining its position as a major airport for the Sky Team alliance and its partners; however, the boundaries set for safety, the environment, and quality of life, and spatial integration with its surroundings might be violated. If so, construction of the new terminal can start. In addition, actions need to be taken to defend the plan with respect to the negative external effects. The noise insulation program can be expanded, and more investment can be made in branding and marketing that aim at explaining the plan. If these actions prove to be insufficient, the noise insulation program can be expanded; Schiphol should start to buy out residents that are heavily affected by noise and increase landing fees for environmentally unfriendly planes. If this still is insufficient, Schiphol should consider limiting the number of available slots, especially during the night and edges of the night. If these actions are still insufficient, either because demand grows very fast or because the environmental impact grows too fast, the plan should be reassessed. If this alternative is chosen, the decisionmakers would reiterate through the adaptive planning steps in order to develop a new (adaptive) plan. Long-term plans must be devised in spite of profound uncertainties about the future. When there are many plausible scenarios for the future, it may be impossible to construct any single static plan that will perform well in all of them. It is likely, however, that over the course of time new information will become available. Thus, plans should be adaptive—devised not to be optimal for the best estimate future, but robust across a range of plausible futures. Such plans combine actions that are time urgent with those that make important commitments to shape the future and those that preserve flexibility needed for the future. DAP is an approach to plan design and implementation that explicitly confronts the pragmatic reality that traditional (static) plans need to be adjusted as the world changes and as new information becomes available. The approach allows planners to cope with the uncertainties that confront them by creating plans that respond to changes over time and that make explicit provision for learning. The approach makes adaptation explicit at the outset of plan design. Thus, the inevitable changes in the plan become part of a larger, recognized process and would not be forced to be made repeatedly on an ad hoc basis, which would be the case if the plan were static. The DAP approach has several strengths. First, it is relatively easy to understand and explain. Second, it encourages planners to think about ‘what if’ situations and their outcomes, and to make decisions over time to adapt while maintaining flexibility with respect to making future changes; this also helps in foreseeing undesirable lock-ins or other path dependencies so that they can be avoided. Third, it makes explicit that adaptation is a dynamic process that takes place over time; it forces planners to consider changes continuously over time, rather than at one or a few points in time as most scenario approaches do. On the other hand, the resulting plan might end up costing more if no responsive actions are needed. Also, setting up the monitoring system may be complicated, the monitoring itself may be expensive over a long period, and policymakers and politicians may resist the idea of committing to adaptive actions in advance. Based on Kwakkel et al. (2010). Kwakkel, J. H., Auping, W., & Pruyt, E. (2012). Dynamic scenario discovery under deep uncertainty: The future of copper. Technological Forecasting and Social Change, 80(4), 789–800. https://doi.org/10.1016/j.techfore.2012.09.012.